The smartphone revolution has changed the way people communicate and get in touch. The advent of social networking sites and communications apps like Skype, Hangouts, Viber, WeChat, and Facebook Messenger allows users to communicate in real-time for free. Emails are now readily available on mobile, so you do not need to wait and sit in front of a PC just to download and open your month-end report. If you are not on a Wi-Fi connection, all these browsing, downloading, and chatting requires mobile data use. If you are not subscribed to unlimited data service, you may need to monitor your mobile data usage to avoid additional charges on your account. 1.From the Home screen, open your iPhone’s Settings app. 2.Tap on the Cellular options from Settings. 3.The figures in the Current Period is your mobile data usage on iPhone. 4.Scroll down to see data usage per apps. 5.Check the coverage of the Current Period in the Call Time section. 6.Clear out usage and start with another monitoring by tapping on Reset Statistics. The action will all data usage statistics to start a new monitoring. 3.Scroll down and tap on System Services. 4.The list of the System Services and their individual cellular data usage on iPhone is displayed. 1.Go to iPhone’s Settings > Cellular > Carrier Services to go to Verizon’s site and check your usage. 2.Create and log into your MyVerizon account and check your data usage on My Verizon Usage Meters. 3.Dial #3282 to request for a text update on data usage. If you have questions and concerns about your mobile data usage, contact Verizon’s Customer Service at 1 (800) 922-0204. 1.Go to iPhone’s Settings > Cellular > Carrier Services to go to T-Mobile’s site and check your usage. 2.Create and log into your T-Mobile account and check your My TMO page for data usage details. 3.Dial #932# to request for a text update on data usage. You can contact T-Mobile’s Customer Service number at 1 (877) 453-1304 for concerns and disputes about your bill and mobile data usage. 1.Go to iPhone’s Settings > Cellular > Carrier Services to go to AT&T’s site and check your usage. 2.Create and log into your MyAT&T account and check your mobile data usage in the Usage & Recent Activity section in the Account Summary page. 3.Dial *3282# to request for a text update on data usage. Contact AT&T by phone at 1 (800) 331-0500 to check data usage and other concerns. 1.Go to iPhone’s Settings > Cellular > Carrier Services to go to Sprint’s site and check your usage. 2.Create and log into your My Sprint account and scroll down to About My Devices section in the My Sprint Page to view your data usage. 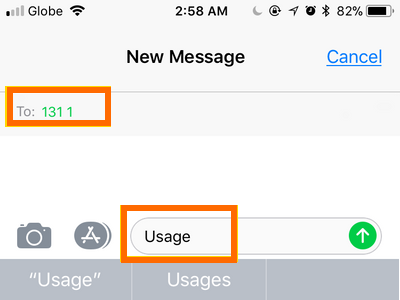 3.Text the word “usage” and send to 1311 to receive a text update on your mobile data usage. Contact Sprint’s Customer Service at 1 (888) 211-4727 for questions and concerns about your mobile data usage. We have just shown you six methods of checking the data usage on iPhone. If you have questions with any of the information provided on this page, let us know in the comments section. Do you want more control on your mobile data usage on iPhone? These related articles will help you save mobile data on your device.